Hardly a week goes by without another ERP vendor jumping into the SaaS market. Earlier this week SAP announced ByDesign 2.5, the latest in a series of announcements by ERP vendors launching applications on cloud platforms. Each of the vendors, now seven of them, who have announced SaaS-based ERP systems all are aiming at the small and medium business market, because the processes there are more scalable and there is less IT investment already is in place that they need to sell around. Yet there is a paradox already starting to emerge, even with just a few vendors in this market. While each of these SaaS ERP providers chase standardization of business processes and the lowest cost per user per month, users often need customization and integration. These two different sets of needs invariably drive conflict into SaaS implementations. Considering the fact that it costs Salesforce.com just $7 per user per month and SAP must be thinking their ByDesign applications will cost slightly more than that, the paradox of cloud computing performance versus cost is already set. It would be feasible, given how hard-set SaaS ERP vendors are on standardized processes, that taking a highly complex ERP implementation to the cloud with legacy integration requirements could end up costing more than an on-premise system. With between 75% to 80% of an ERP implementation in services, it’s clear that a complex SaaS-based ERP implementation could get very expensive, very fast. Every SaaS vendor knows that if they stay too long in the low-end of the market they risk being cannibalized by competitors who may not have emerged yet but have the financial and intellectual capital to quickly overtake their markets. Google moving into CRM is a case in point. With a brain trust on social media emerging and the ability to map social relationships, Google could move into the CRM market anytime it wants. What are they waiting for? Based on cloud economics, they are going to let the consolidation of SaaS CRM hit first, watch the shakeout, and pick up vendor(s) at pennies on the dollar. Alternatively, they could easily create their own CRM system complete with integration to social networks and quickly have the uber-social CRM system that only exists on white boards today. Why aren’t they doing this now then? Because they realize that the greater the process they can own the greater the standardization value, the lower cost per user per month, and the greater the profit potential. The lower the complexity of a process enabled by a SaaS vendor, the lower the cost per user per month to support. That’s the good news. Yet being the leader of a market segment with a low-end, easily automated process is not a good place to be, there is little if any differentiation and value-add based on process complexity expertise. Unlike CRM which has well-defined processes and strategies that can scale across companies, ERP systems are highly unique, defined by the accounting, finance, pricing, product, and production requirements that are entirely different to each firm. In a sense, an excellent ERP system is a representation of a company’s DNA. It is a great match to who they are. ERP system installations that really stand out have been managed as projects exceptionally well, have had training and change management programs planned and executed well before the system went live, and have overcompensated in communicating. Top management support is a factor, but when it comes down to it, people’s role, how they perceive it and the extent of their ownership of the system will determine success or failure. It really is all about trust. The most common early adopters of SaaS-based ERP systems are smaller companies where the business processes, even the most critical ones of the company, are still agile and flexible. Often these early adopters have minimal investments in IT and may have had a previous-generation ERP system installed but found that the maintenance costs and annual fees were out of proportion to the value they were getting. In many cases a larger ERP system, inordinately expensive for these smaller firms had been purchased and rejected by the core departments that rely on it most due to lack of usability or lack of customization to their needs. SaaS-based ERP systems are doing well in these companies due to their ability to automate relatively standardized processes like analytics or financials as ByDesign 2.5 does, while keeping the cost per user per month down. SaaS-based ERP systems are progressing in terms of integration functionality, yet this nascent area shows weakness when it comes to support for Master Data Management for example. 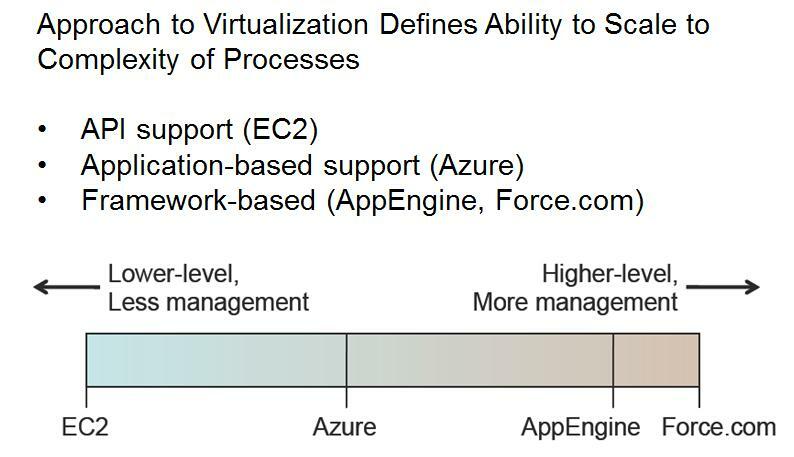 What SaaS ERP vendors are betting on is that the APIs of cloud platform will increasingly go in the direction of supporting greater process complexity, as the following graphic from the presentation Above the Clouds A Berkeley View of Cloud Computing by the UC Berkeley RAD Labs illustrates. The scalability of computation models and storage models is good news for SaaS ERP vendors. It means they can go up-stream in terms of process complexity, be assured of good application performance and best of all, keep the cost per user per month down and stay profitable.